UW plays a key role in the state’s diversification strategy. Imagine Wyoming in the year 2038. If the state’s ENDOW—Economically Needed Diversity Options for Wyoming—initiative has anything to say about it, that future will include 100,000-plus new jobs, 35 percent of those in rural communities; 79 percent personal income growth; 82 percent gross domestic product growth; 108,000 new residents; and a 30 percent decrease in youth outmigration. The initiative aims to coordinate and expand ongoing efforts across the state, as well as to produce measurable results expanding the Wyoming economy. Like most states, Wyoming’s governors serve for four years between elections. Past efforts to strengthen and diversify the state’s economy have been tied to those terms, lacking the long-term cohesion and vision for lasting change. That’s why ENDOW spans 20 years. A partner in ENDOW, UW plays an important role in areas including the state’s educational attainment goal, new and expanded laboratories, energy research, agriculture, health care, entrepreneurship, and new degrees, certificates and online options. “UW has a massive role—and arguably the biggest role—in creating the new economic future in Wyoming,” says ENDOW Chair Greg Hill, a UW distinguished alumnus who is president and chief operating officer of Hess Corp. As part of that role, UW must produce students who will help drive the economic engines of Wyoming, he says. The five pillars of ENDOW are advanced manufacturing, agriculture, knowledge and creative, natural resources, and tourism and recreation. “Within knowledge and creative is the whole notion of entrepreneurship,” Hill says. 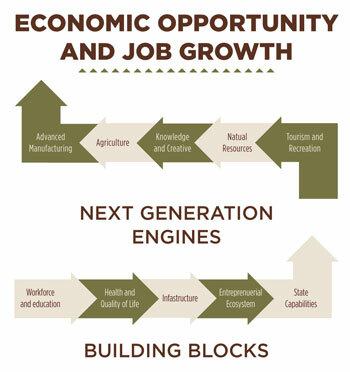 For example, the use of technology and partnerships with community colleges can help offer ongoing education to people throughout the state and also help connect UW’s Institute of Innovation and Entrepreneurship with those seeking assistance with developing and starting businesses that contribute to Wyoming’s new diversified economy. Significantly expand UW’s footprint beyond Laramie to ensure Wyoming residents have physical and digital access to a wide range of bachelor’s and graduate degree programs. Enable shared infrastructure—including federal and university laboratories—to facilitate productivity gains and enable companies to market new products. Establish UW as a globally pre-eminent science, engineering and energy research university. Establish a premier agriculture innovation and research/training center at UW. Evaluate development of health care and telemedicine medical education facilities with a focus on developing providers with expertise in rural health care, primary care, elder care and telemedicine/telehealth. You can read more about UW’s efforts to diversity and strengthen Wyoming’s economy throughout this issue of UWyo Magazine. To learn more about ENDOW, visit www.endowyo.biz.